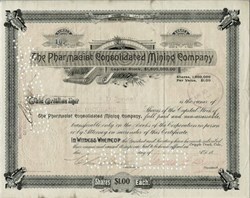 Beautifully engraved certificate from the Pharmacist Consolidated Mining Company issued in 1899. This historic document was printed by the Denver Litho. Bank Note Company. This item is hand signed by the Company's President, James F. Burns and Secretary, Charles N. Miller and is over 118 years old. A.D. Jones was the discoverer of the original Pharmacist Claim.